We catch up with Gouger on board the Africaine once again this week. 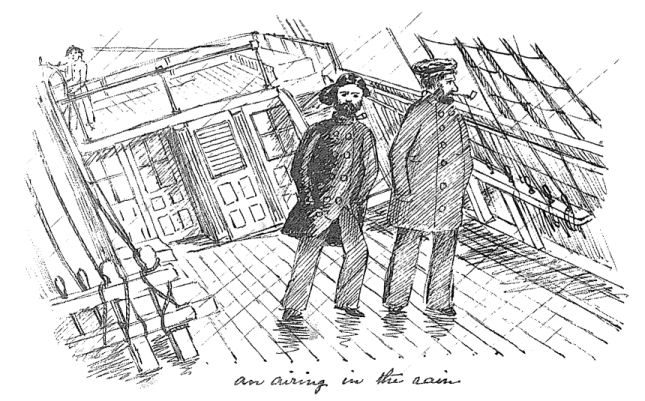 It is becoming much colder on the ship and his family does not have enough warm clothes to wear. Gouger writes in detail about the facilities in his cabin and on the Africaine that enable him to have light, filter water and live onboard in relative comfort. Gouger records his observations so that they may be used as a guide for other wealthy passengers who may travel in the future. This gives us a good opportunity to look at how the technology available in 1836 was used to provide lighting and heating in 1836 both on land and at sea. What do you think caused the change in temperature that Gouger describes? What forms of lighting are used onboard our ships? What facilities were available to provide light, warmth and comfort for passengers? What can we learn about 1836 technology by reading Gouger's description of the facilities onboard? What sources of light were used in houses in 1836? How did people provide warmth and heating for their homes in 1836? What are some of the significant inventions and technological advancements that have influenced the lighting and heating sources people have used over time? What are some of the current issues with heating and lighting sources used today? What are the most sustainable and economical sources of lighting and heating currently available? Construct a class timeline showing the history of light sources over time. Include significant inventions and developments such as oil lamps, gas lighting, electric lighting, street lights, neon lights, infra-red light, energy-saving light globes etc. Add images and information about the different materials, fuels and inventions used for lighting over time. Select two different light sources and do some research to compare the two sources. What are the similarities and differences? Think about the way they work, fuel used and the materials they are made from. Read through this week's journal post written by Gouger and imagine that you are a member of his family. Draw a picture of Gouger and his family in their cabin based on the description Gouger gives us. Gouger has recorded his observations for wealthy passengers who may be planning to travel by ship to South Australia in the future. If you were using his guide to plan for your own voyage what else would you want him to write about? Think about the information that would help you most to prepare for the ship. Read Gouger's description of the facilities in his cabin and create a diorama to show what a similar cabin might look like. Be sure to include at least one source of light. Does your cabin have access to natural light? How will passengers make themselves comfortable in your cabin? 1. Collect catalogues that feature products used for heating and lighting homes. Select some of the items and do some research to find out what was used as an equivalent or similar source of light or heat in 1836. Use the pictures from the catalogue and your own drawings to create a 'before and after' chart. 2. Imagine what it would be like to live with limited light, particularly as a steerage passenger below the deck. Plan a 'black out day' for the class where the daily routines and activities have to be conducted only using natural light and no electric lights may be turned on (or darken the room as well if appropriate). How does this impact on daily routines and class activities. What changes need to be made? Use a PMI to record the positive, negative and interesting observations of the day. 3. Conduct a survey of the types of heating that students in the class have in their homes. Who uses electric heating, gas heating or wood fires? What other strategies are used by families to keep warm? What is the most popular source of heating used by families in the class? What factors do people consider when choosing how to heat their homes? 4. Use thermometers to measure the temperature in a range of different places around the school. Compile a chart to show how room temperature varies across the school. Suggest reasons for the differences and compare the temperature at different times of the day. 5. Design a light to use in your classroom. Use batteries, alligator clips, wire and light globes to make a simple circuit. Experiment with ways to make the light as bright as possible. 6. Look through the real estate section from a weekend newspaper or a real estate web site. Read some of the descriptions of the homes for sale. Do any of them refer to lighting or heating? Design a real estate advertisement for a home in 1836. How will you describe the facilities available for heating and lighting in the home? 7. Which light source is most effective in lighting a darkened area in the classroom? Create a dark area using curtains, tables or dividers and provide a range of light sources. Challenge students to make the area light enough to read a book. Try a variety of torches, lanterns and other light sources. Gouger recorded his observations of the facilities onboard so that they could be used by other wealthy passengers to plan and prepare for future voyages. How would these observations differ if they were recorded by a steerage passenger? What advice would you give to a passenger planning to migrate to South Australia? It would be easier to provide lighting and heating on a ship today than it would have been in 1836. Next week we will join the Gouger family once again as they spend time exploring Cape Town. They manage to fit in some sightseeing but their main activity is to go shopping for livestock and other supplies. We read about the horses and carts that were used for transport in Cape Town and this gives us an opportunity to look at the different forms of transport that were used in 1836.